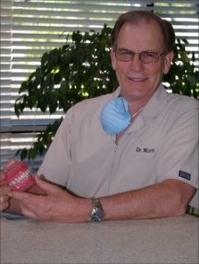 Dr. Worth began his dental career after graduating from UCLA School of Dentistry in 1972. He began as a general dentist in the Public Health Service working on the Navajo Reservation in New Mexico and the Crow Reservation in Montana. Orthodontics had always been his specialty interest so after his rewarding experiences on the reservations he began his orthodontic studies at University of Southern California, graduating in 1977. Currently, in addition to his orthodontic practice, Dr. Worth takes great pride in teaching orthodontists how to prepare for becoming Board Certified by The American Board of Orthodontics. Dr. Worth has numerous professional affiliations. One of particular enjoyment is being an Assistant Clinical Professor-member of the Craniofacial Team at UC Davis School of Medicine. He also gives many regional and national presentations to various orthodontic organizations (PCSO, AAO, Angle Society, University of CA at San Francisco, and University of the Pacific School of Dentistry. years—doing what I love to do”. Dr. Worth lives in the Granite Bay Community with his wife, Linda, and after 39 years of marriage they are enjoying grand parenting time with their beautiful grandchildren. Dr. Worth spent many years coaching youth sports and now also enjoys spending some of his free time fly fishing, gardening, biking, and being involved in the Granite Bay Rotary Club.